The planning commission has already heard and considered the change, which will permit the use of digital signs along Highway 13 zoned highway commercial. Town Planner Anna Smith said the planning commission’s vote to approve changing the ordinance was 3-2, with commission members concerned about changing the “character” of Market Street. Currently, the only digital signs permitted are time and temperature signs. Restrictions, which the Colorado Department of Transportation establishes, would limit the use of digital signs to no more than one sign per 1,000 feet on the same side of the highway. The signs cannot have the “appearance” of movement — as in flashing, fading, dissolving, or animated “Vegas-style” signs. Advertising on the sign must be limited to that business at that location only. Other restrictions include size and nighttime light intensity. The public is invited to the March 17 hearing to discuss and share their opinions, and ask questions, about the proposed changes to the ordinance. 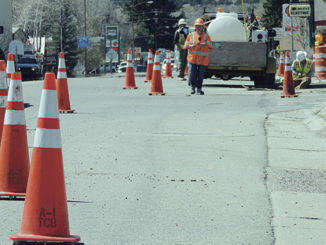 RBC — On Feb. 19, the state Transporta-tion Commission approved a list of “ready to go” highway projects to be funded with federal dollars provided by the American Recovery and Reinvestment Act (ARRA) of 2009, and State Highway 13 is on the list. While Colorado will receive more than $500 million for transportation projects statewide, CDOT will receive $317 million in federal highway funding and another $12.5 million in federal transit funding for transit projects in non-urbanized rural areas.The ARRA will also provide the additional transportation funding directly to transit agencies and the three large metropolitan planning organizations in the state (Denver Regional Council of Governments, Pikes Peak Area Council of Governments and the North Front Range Metropolitan Planning Organization) for their prioritized projects. As a requirement of ARRA, CDOT must have at least 50 percent of its $317 million in funding committed to projects within 120 days. The remaining funding must be allocated to projects within one year. MEEKER — On Sunday, Oct. 5, the Rio Blanco County Historical Society will host a quarterly meeting at Kilowatt Korner at Sixth and Market streets in Meeker.